Retap stands for Refilling with TAP water. 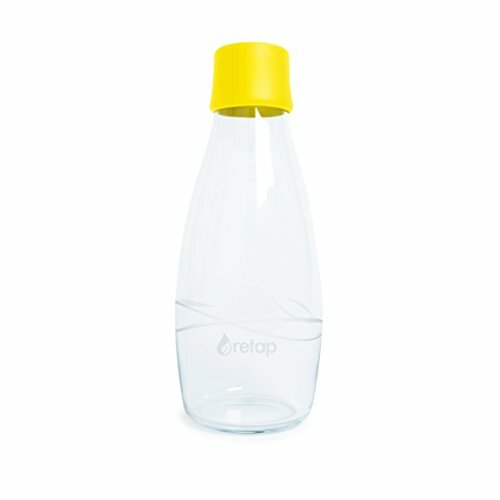 Retap is a Danish hydration company founded in 2009. We believe the best way to drink water is refilling resuable drinkware with tap water. The Retap bottle is especially designed for drinking water and therefore high quality, clean and nature friendly. The Retap bottles are of the highest quality borosilicate glass, the same durable glass also used in laboratories and high-end cookware. Safe, strong and reusable. Borosilicate glass will not wear down over time, the bottle is designed without any edges where bacteria can grow or accumulate, thus making cleaning easy and safe. The bottle and the lid are both suitable for cleaning in the dishwasher. Our tops are very unique and they do not leak, made of thermoplastic elastomers (TPE). Stick your bottle in your handbag, backpack or briefcase and do not worry that you will find a pool of water at the bottom. The Retap Water Bottle is going to keep you well hydrated. Use it for home, work, trips to the beach, mountains or for whenever you want a drink of clean crisp water. KEEP REFILLING - Refilling a reusable bottle is easy, inexpensive and the simplest act of personal environmentalism you can make. By refilling a reusable Retap water bottle you help lessen the environmental impact of transporting water all over the world and significantly reduce the mountains of trash created by plastic bottles. CLEAN, LIGHTWEIGHT & STRONG - Both bottle and cap are dishwasher-safe and designed without any edges where bacteria can accumulate and grow. Lightweight and strong, Retap bottles are made from strong, heat-resistant borosilicate glass, the same durable glass used in laboratories and high-end cookware. TAKE IT WITH YOU - The no-spill lid locks in place so it's safe to carry in your purse, briefcase, or gym bag. The 10-ounce and 17-ounce bottles fit in car cup holders, while the 27-ounce bottle is great for power drinkers and on a desk or at a table. SCANDINAVIAN DESIGN - The Retap Bottle is awarded for its simple and functional scandinavian design. Retap has won several prestigious awards including the Red Dot Design award and GOOD DESIGN award. SAY NO TO PLASTIC - We dream of a world where our oceans, rivers, and lakes are free from plastic pollution. Our mission at Retap is to rethink the way we drink water. View More In Hydration & Filtration. If you have any questions about this product by ReTap, contact us by completing and submitting the form below. If you are looking for a specif part number, please include it with your message.